Make quality make sense - and create great care in the process. I specialise in developing and implementing quality systems in health and human services that ‘make quality make sense'. Whether it's setting up a new system or enhancing an exisiting one - across an organisation, a department or a service - you'll find a tool, video or information to help you right here. 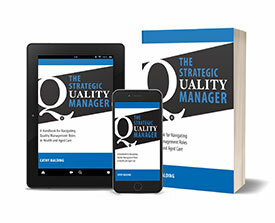 Join the QualityNews email list to receive regular tools and tips on the latest quality, safety and governance issues - and receive my free quality system assessment tool. I look forward to you joining the thousands of people committed to going beyond compliance to creating greatness with their consumers! Cathy’s books support people in implementing the SQS model to achieve great point of care for consumers & staff. 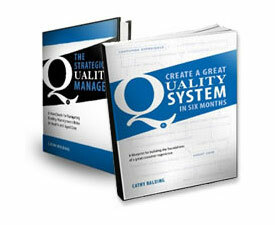 Tools, Tips & Resources are designed to help you make your quality system more dynamic, effective, savvy and practical. Qualityclass online & face-face training products are designed to equip teams with straightforward knowledge & skills. Helping health, aged, community & human service organisations fulfill potential to create great care. 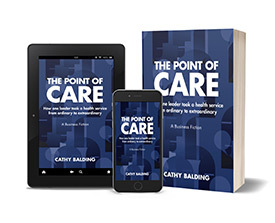 New book - The Point of Care: how one leader took a health service from ordinary to extraordinary. Now available! If you need a break from reading reports, minutes and articles, take some time out and enjoy this fictional tale about a health service with six months to break out of their mediocre results and achieve something great with their consumers. Find out more here. We’re back! – with another episode of “No Harm Done”, hosted by Cathy Balding and Cathy Jones. NHD is a podcast about improving, exploring, understanding and getting on with health and human services' safety and quality governance, improvement and creation. We discuss the ups and downs of how to pursue and partner in high-quality care: so if you're a consumer, staff member, board member or bureaucrat - NHS will have something for you! And if you have a leadership role in a human services organisation, NHD will help you enact it! When you've had a listen we'd be happy to hear your thoughts and suggestions on the NHD website so we can make it as useful as possible for you and your role - so leave us a comment or a question on the podcast website - or a rating on iTunes - and let us know if you'd like us to address something in a future episode that would help you. LOOKING FOR THE MONTHLY QUALITYNEWS BULLETIN SIGN UP? You'll find it by clicking on the free 'Quality System Assessment Tool' button above - you'll receive the tool when you sign up to receive the latest tips and info on creating great care, every month. We take organisational improvement from the dry and technical topic it can be and embed it in the story of a CEO trying to make a difference against the odds - and against time. A Handbook for Navigating Quality Management Roles in Health and Aged Care. This book contains theory, tips, step by step models and practical examples. A step by step blueprint for building and implementing a quality system that staff will want to use to create a great consumer experience for every person, every time. 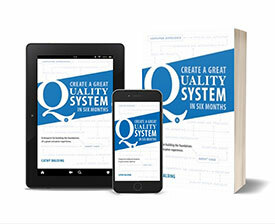 Purchasing The SQM Handbook & The CGQS Blueprint Book in this pack gets you 15% off the price of buying both books. Together they provide the framework to build effective quality systems for achieving high quality care.